This is a scarce 1851 example of John Tallis and John Rapkin's 1851 map of Western Australia. It covers southwestern Western Australia from Champion Bay south around Sussex to Doubtful Island Bay. This map records the early settlements of the United Kingdom in the western part of Australia. It notes numerous counties, roadways, rivers, geographical features, and more. Swan River is identified. The Swan River Colony including Perth was settled by the British in 1829. York, noted here, was the first inland settlement by the British in 1831. Albany with King George Sound, along with its surrounding areas is called Plantagenet, supposedly named so because King George, the reigning British monarch at the time, believed that he was related to the Plantagenet lineage of kings, who ruled many centuries earlier. 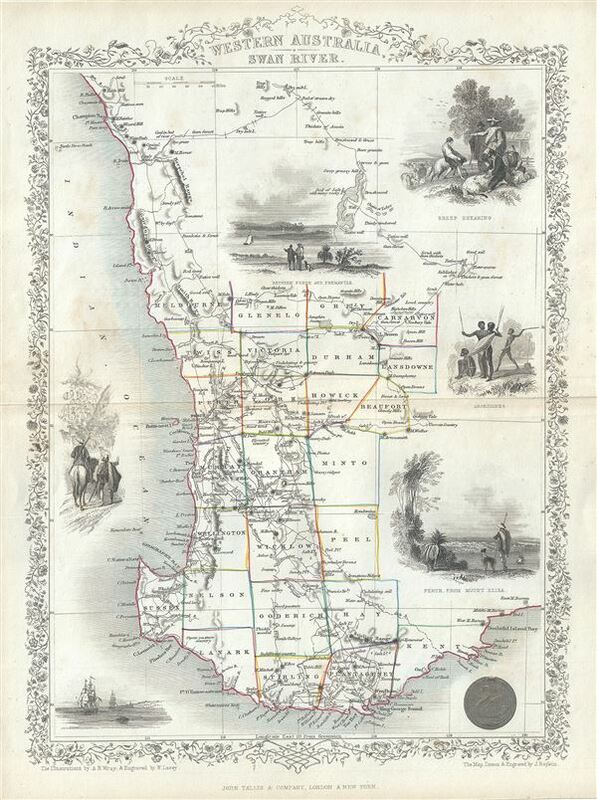 This map includes illustrations by A. H. Wray of Sheep Shearing, Aborigines, Perth from Mount Eliza and a view Between Perth and Fremantle. Illustrations of ships and natives is also included. The whole has the highly decorative presentation and elaborate border distinctive of Tallis maps. This map was issued as part of the 1851 edition of John Tallis and Company's The Illustrated Atlas, And Modern History of the World. Rumsey 0466.055. Phillips (Atlases) 804.